I love the LuLu Citris!! They are all sooOo freakin' cute! My favorite color is orange, so I would choose the Olivia in citrus. These are just so cute! These are fabulous! I would love the lulu black and white wrappers! These are fascinating. I have never seen anything like these. I like Olivia - Red / White. Lulu in black!! so classy!! All of them are fabulous! Truly gorgeous, so glad someone thought of this. I LOVE the Olivia-Blue/Chocolate brown!So cute! What great wrappers! I love all the wrappers, it was sooo hard to pick just one. My choice is Lu Lu - Black/White, but Hannah - Blue/Chocolate is close second. How do you pick just one? I like the lu-lus in black and white! ms(dot)rikkiroad(at)gmail(dot)com! Seriously... those are too darn cute!!! I don't think I can choose just ONE... so I'll pick the assortment 18 pack!!! I think I'd have to go with the classic Hannah black and white wrappers even though they're all cute! Boy was this tough to choose just one....they are all gorgous!!!! I don't think I could choose! I like the assortment on the 2nd page! huge fan of the olivia in chartreuse / soft yellow. absolutely beautiful! i am crossing my fingers.....!!! It's so hard to choose. I have to say Lu Lu - Blue/Chocolate Brown. I LOVE all of them but would pick the Olivia - Red/White. They are adorable! I would love Hannah in blue/chocolate. So much fun. 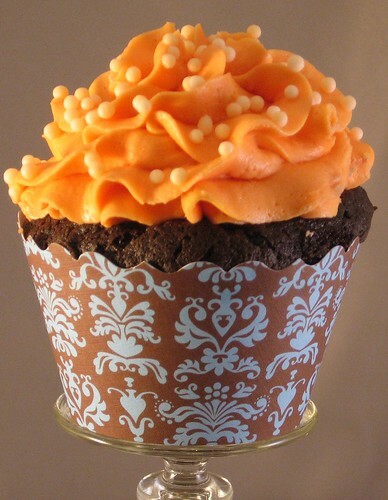 I love the "lulu" orange and pink wrappers, and would love to give them a try on my cupcakes! My favourites are the "Hannah - Black / White" wrappers! I would love to get my hands on the Hannah red and white wrappers! I love the lulu citrus--soo cute. They are all adorable. What a great giveaway!! Thanks for the chance! Oh I think the LuLu RED was gorgeous! I am so drawn to red though. I love these wrappers!!! I love the Hannah soft pink/grey! I would choose the olivia soft pink - they would be perfect for my daughter's first birthday party. We're having a cupcake party! (You don't have to publish my first comment - I forgot my email address on that one. Oops! I love the lu lu in citrus and pink and would use it for a chai tea inspired cupcake for my boyfriend. Beautiful and delicious! I love pink! Any one with pink! These are awesome. They are all so cute! :D But I think my favorite is the hannah design in citrus and bright pink. wow, those red/white ones are gorgeous!! I can't choose. I could be surprised. Of course they are all amazing which makes it so difficult to pick. But if I had to pick, I'd say my favorites are LuLu in blue/brown. How upscale-looking! The wrapper are so chic! I would choose Lu Lu red / white! Oh my... how cute are these? My mind is racing. I do like them all but especially the Olivia in brown and blue. Yummy! The Hannah wrappers in blue/chocolate would look divine with a simple chocolate cupcake! I LOVE the Lu Lu - Blue / Chocolate Brown wrappers...the colors match my business cards!!! I have always had a thing about the blue and chocolate color combination and definitely love the olivia design! My first choice would be a variety pack because they'll all fantastic! If I had to pick just one I love the hannah in soft pink and grey. lulu red and white, all the way! howdyamy at yahoo dot com. Oh these are all so charming! I think the Hannah chartreuse soft yellow pattern would be just perfect with a moist coconut cupcake! Yum! My daughter turns 5 in September and she loved the cupcake wrappers and wants some for her birthday party. ooo ahhh, i LOVE these fancy wrappers! I would like to have one of each of the Hannah collection, but especially the red ones! very cute! I like olivia- red/white! Really loving the Hannah in black/white. So cute! I love the Olivia in soft pink/medium grey! Can I move to the US for just this once?? Love those brown and blue wrappers, but they're all great. Oh my word! I'm going to go with lu lu in black & white. It's very me! those wrappers are so nice! 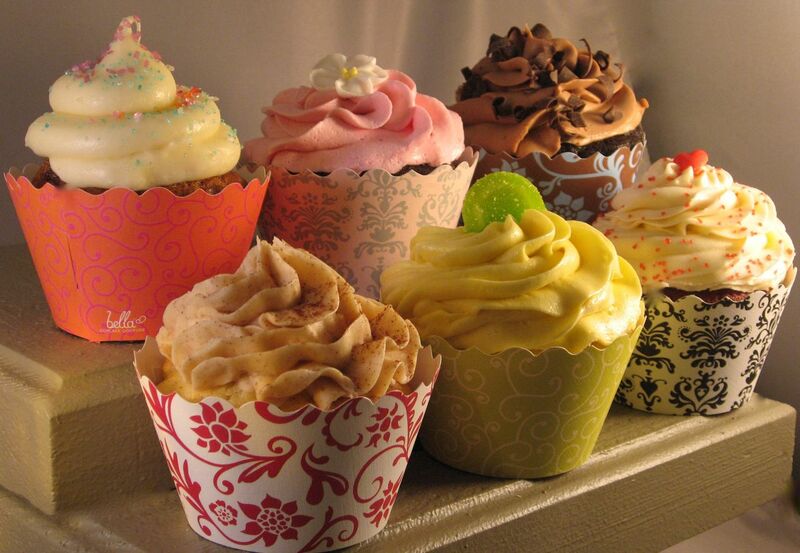 I'd love matching up cupcake flavours to colour co-ordinated wrappers! they are all so beautiful but my favorite is the hannah in red/white. I love the Lu lu black, it looks so elegant. they are all very pretty. I would pick Olivia in pink nad grey! They are beautiful! i'm liking the assortment package..a little of everything! so cute! Cute! I would have to say my favorite are any of the blue-brown colored ones. I really like that color-combo. I love all of them... but the Olivia chartreuse is making me think of a beachy cupcake... Buttercream, sugar sand, chocolate shells, edible pearls. Okay, now I'm hungry! Okay, so apparently I don't follow rules well. My email is mooj at nc.rr.com. Too early - need more coffee! I love these wrappers! I particularly love the hannah-black and white! I could see some hot pink icing with those. These are beautiful! I like the Olivia Red. They are all fabulous!! If I had to choose I would pick Hannah Citrus/Pink, but I love them all! Wow - these are adorable and would adorn my newest cupcake creation perfectly! I'd love to win the LuLu blue/chocolate brown wrapper. I love the Hannah wrapper in blue and brown....pretty! These are beautiful and MUST make the cupcakes taste better! :) I would love to have the blue and chocolate brown Hannah's!! the lu lu black/white ones would look amazing on a cupcake with bright turquoise frosting! I hope I win!! I love the soft pink and grey lulu wrappers! I have been looking at these for my wedding cupcakes. I love Hannah Soft Pink / Grey! Those are such pretty wrappers. My fave has to be lu lu in soft pink/grey. These are beautiful! 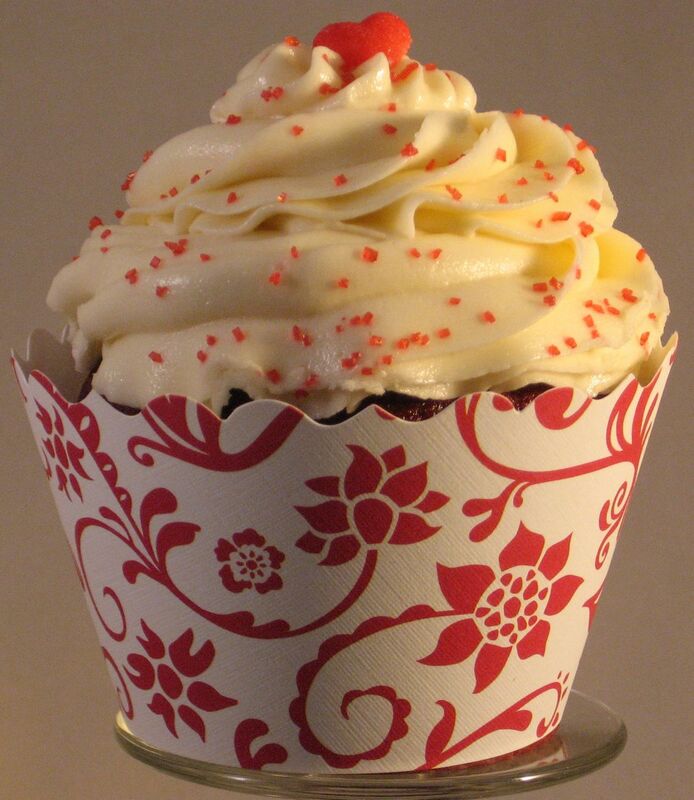 The lulu red/white would definitely be perfect for Christmas cupcakes! I think they are all fun! I, particularly, like the Hannah style in red or black. They would compliment the butterfly cupcakes I had thought about for a baby shower! Beautiful wrappers. I would pick the "Olivia" in blue/chocolate. Luvin 'em all but lulu red/white is my fav cuz it pops! Thanks! i would love the olivia soft pink! i totally need it for an upcoming bridal shower! cschow [at} gmail [dot] com. These are soooo cute! You weren't kidding- it is a tough choice! if I did have to pick (just one), it would be the hannah black/white. I would love to use the hannah pink and white wrappers. My start-up business color is pink and these would be great. Thanks for making something so pretty for cupcakes. I would choose Olivia blue/chocolate. i agree - really tough to pick just one! i think i'll have to go with Olivia - Chartreuse / Soft Yellow. These are from my home town! I love the "Olivia-red/white". A yellow cupcake with white buttercream and a cherry on top would be perfect! how to pick just one! I love them all but I think the olivia black/white is my favorite. I bring cupcakes to all my friend/family occasions so these would be great to have on hand to make the cupcakes even prettier! Cute cute cute! How creative and beautiful! I love the lu-lu black and white wrappers!!! I would choose Hannah citrus & bright pink or Hannah red & white or Lulu black & white. Definitely the olivia-red/white ones! They're all adorable though. And I love the slogan "Have your cupcake and adore it too" - too cute! I absolutely love these. I love the black and white damask ones. I love the red and white Hannah ones! Gorgeous! I love the orange and pink ones! I'd like the Hannah blue/chocolate wrappers. I made blueberry cupcakes last night and the icing was a disaster, but if I had these, I'd make the icing all over again and get it right this time. I totally love the Olivia - black/white wrappers. They're so beautiful and simple, they just about scream elegance. But of course, they wouldn't really scream -- because, duh, that wouldn't be elegant. they are all so gorgeous, but if i'd be so lucky to win, i'd opt for the lu-lu in blue/chocolate brown. Rylie Breeden - rylz_wid_stylz@msn.com. I love the Lu Lu citrus and bright pink. So cute. Love them all! I would pick the Lu Lu - Blue / Chocolate Brown. I have an obsession with anything blue and brown! I love the Hannah in black and white! Beautiful! My fave is the lu-lu black/white wrappers! I really like the pink and grey design! Very chic! hard choice! I love them all... adorable! I''l pick the Lu Lu Red / white for today. I love the lu-lu black and white wrappers! They would be great to wrap around cupcakes and surprise my fellow PTO board members! Thanks for a chance to win! Oooh! I want the blact & white ones! They're all so beautiful! I would choose the olivia- soft pink/med grey. It's so hard to pick just one...but I will go with the "Lu Lu" red! So cute! I love the black and white olivia! These are amazing and really class up cupcakes! My favorite is Lu-lu with citrus and hot pink! Perfect for a late summer party! So Chic! I'll take the assortment pack. I love all of the Hannah styles! Since I have to choose one I will go with Hannah - Citrus/Bright Pink. Lu Lu or Olivia--those are my faces. Adorable wrappers! I love the Lu Lu - Red / White. Beautiful and classy! very cute! i like the "Olivia - Chartreuse / Soft Yellow" best. I would pick the hannah wrappers in blue and chocolate, although they are all adorable! They are all so beautiful! My favorite would have to be Lu Lu Black/White. 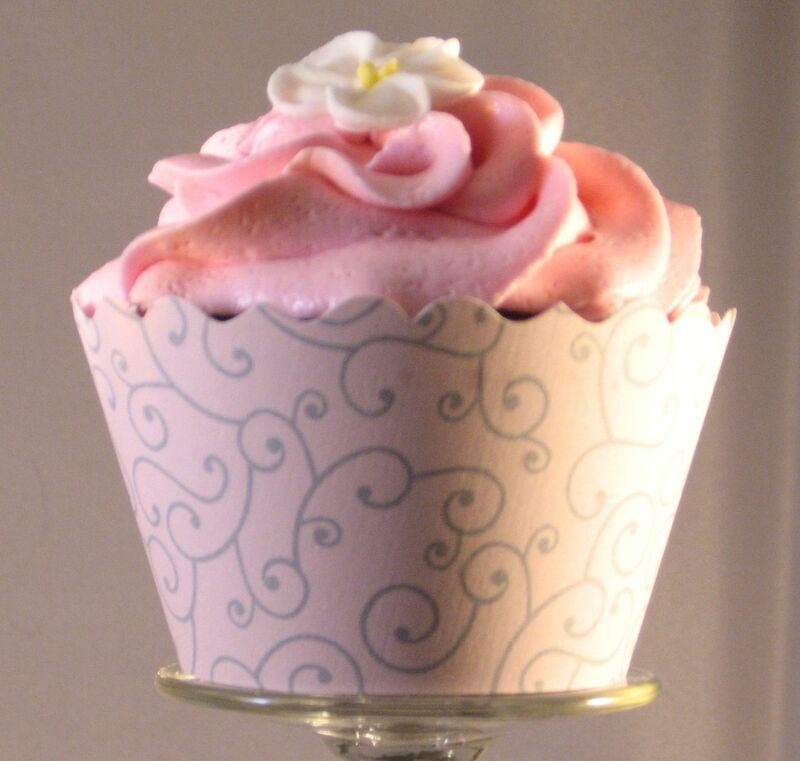 This is a great way to make cupcakes look really sophisticated! LuLu red and white is fantastic. So fancy! These wrappers are all gorgeous! LuLu Black/White is my favorite because it reminds me of a beautiful diningroom wallpaper, sophisicated and elegant! 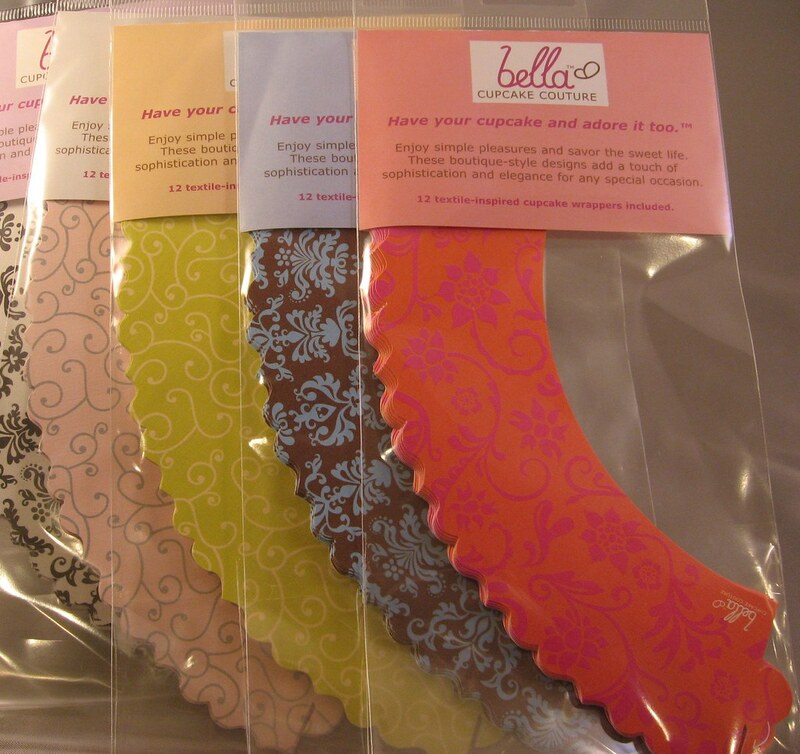 Beautiful cupcakes and wrappers - my fave is the Lulu, orange w/pink. I like Hannah, Soft Pink/Gray! I looooove the black and white damask wrappers!! Wow! Gorgeous wrappers! They almost make you take your eyes of the cupcakes themselves... (almost!). I'd choose the elegant Olivia - Soft Pink/Med Grey! These are beautiful! I would LOVE the Olivia/Blue wrappers! You're making me choose??? AAHH, I love them all. I like this one: Lu Lu - Citrus / Bright Pink but would be thrilled with any, or an assortment! Totally lovable. I'd go for the assortment - variety is the spice of life after all. love these wrappers! I would be quite smitten with the Lu Lu soft pink and grey ones! Weeeeee, how fun! I really adore the Lu Lu - Chartreuse / Soft wrapper! Amazing! I need these on my cupcakes! I love the Lu Lu black and white damask print liners. Super cute. They are all so beautiful! I would love the LuLu in black/white. I love them all! I think he lulu black/white & Olivia are my favorites. They are really all just FABULOUS!!!! I love Olivia - citrus/bright pink! Anything pink makes the day better. The Olivia in black and white are beautiful! wow these are lovely and as a new cupcake bakery entreprenuer i love the hannah chartruese after my neice hannah who said i was the best baker in the world..
oh how can i pick?! I'd love the hannah blue and chocolate ones! i'd like either the lu lu black and white or the assortment. thank you! ooooooohhh, only pick one! That is hard, but since I'm have a black and white party for my daughter, i'd have to go with black/white lu lu! But they are all FABULOUS! All the patterns are charming. But I like the Olivia Blue/Chocolate. I make chocolate flavors so much, they would go perfectly. would love to know who you ordered your packaging from. Your wrappers are wonderful...do you make them yourself? I love the vintage look to these wrappers! These would go great at a fancy cocktail party, or even a laid back tea party with my friends. The Lu Lu black and white are my favorite! They all look beautiful, but my favorite is the Olivia Blue/Chocolate. Gorgeous wrappers, my favorite are the hannah pink and grey, probably because my name is Hannah! his105 at psu dot edu. I would love the lu-lu in black and white. I could make some gorgeous cuppies with those!! The lu lu black is great, how much fun!